When worn by a British or French military officer, a "gorget" was a metal badge of office, signifying that the man was not a common soldier. 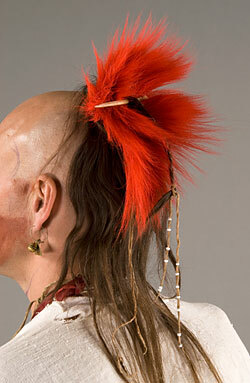 The Wôbanaki people liked to wear gorgets simply for adornment. People cut up brass kettles received in trade to make their own gorgets, or they made them from shells, such as the one shown here. This man's beads are called "wampum", or in Abenaki, "wôbôbial". The purple beads are made from the thickest part of quahog clam shells found along the New England seacoast. The white beads are made from clam, whelk and other white shells. Jewelry was worn by men and women. 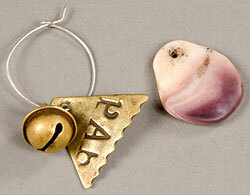 The earrings seen here are made of brass and quahog shell. People often slept with their earrings on. Earrings are called “saksohanal”. 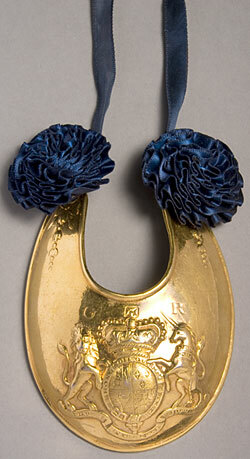 These are brass armbands, called “wpedinibial.” They were made by cutting up a kettle received in trade. These are deerskin leggings, called “medasal”, They are tied to a belt at the waist to keep them up. Leggings were worn for warmth and to protect one's legs when walking through scratchy undergrowth. This hairpiece is called a "roach". It is made of dyed red hair from the tail of a male deer. The Penobscot word for roach is "wesewal", which means "faith". A roach was an important and deeply meaningful ornament. This man wears garters, called “kiganibial”, just under his knees. They are made from wool yarn, using a technique called "fingerweaving". As the name suggests, fingerweaving is a way to weave by using just the fingers. 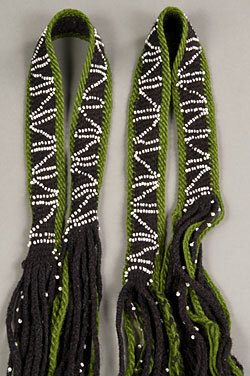 These garters are decorated with white glass trade beads that were sewn on after the garters were woven. The garters help to keep the man's leggings in place. The ring and bracelet seen here are made from brass. The bracelet was made from a kettle. Wôbanaki people used some kettles received in trade for cooking and cut up others to make into jewelry. The ring is called a "bague a cachet" (plaque ring) by the French. This style of ring was given to Native people by traders, soldiers, politicians, and Catholic priests. 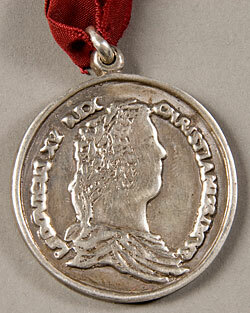 This silver medal is being worn simply as jewelry. Wôbanaki people believed that wearing a lot of shiny and sometimes noisy jewelry of various shapes helped to scare away evil energy and spirits. 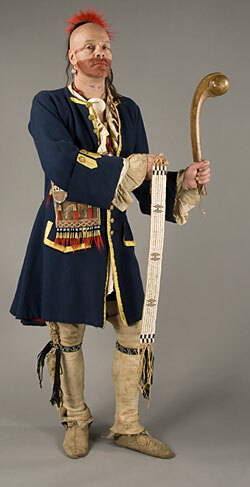 This is a "French chief’s coat", made by the French and intended to be worn by the Native American chiefs with whom they traded. The coat is made of wool. It is interesting to note that the wool cloth preferred by the Wôbanakiak for clothing was usually either red or blue. This is a wooden war club. The clan symbol of its owner is carved just below the club head. The lines underneath might signify how many times the man had been to war, how many war party members there were, or how many prisoners were taken. 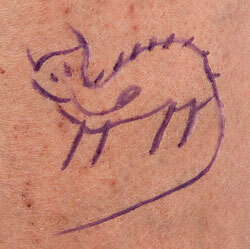 A man might also decorate his war club with an image of his own face or copies of tattoos on his body. 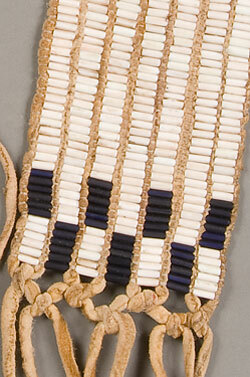 This wampum belt is composed of glass beads. The Abenaki word for wampum is "wôbôbial". White signifies peace, clarity, calmness, and friendship. Dark beads signify conflict or complexity. The belt might have been a gift to the man holding it. 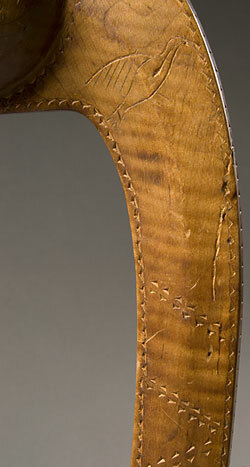 The ends of the belt are knotted; among the Wôbanakiak, this might symbolize a personal belt belonging to this man. 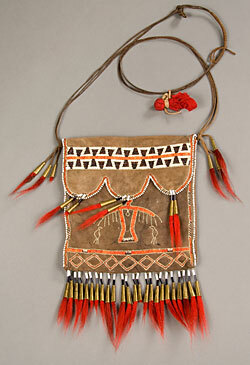 This deerskin pouch is decorated with tufts of deer hair dyed red, embroidery of flattened, dyed porcupine quills, white glass beads, and cones made from a copper kettle. The cones would serve as bells, making a pleasant noise when the bag moved. A bundle of tobacco is attached to the bag's strap.